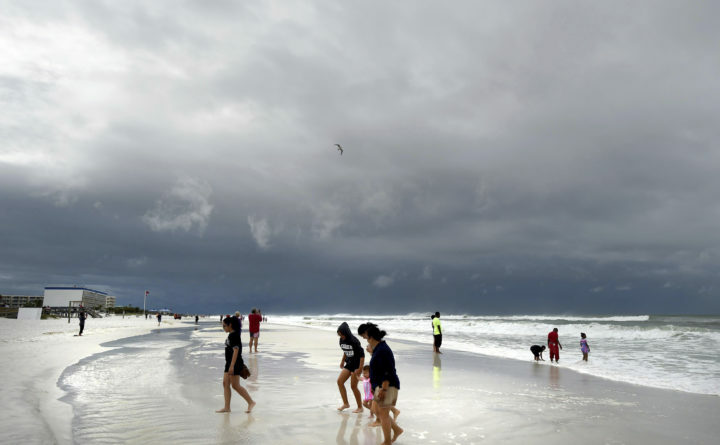 Beachgoers walk on Okaloosa Island in Fort Walton Beach, Florida, Monday, May 28, 2018, as Subtropical Storm Alberto approaches the Gulf Coast. The 2018 Atlantic hurricane season’s first storm, Alberto, made landfall along the Friday panhandle late Monday afternoon. It came ashore in Laguna Beach, Florida, which is just west of Panama City, as a subtropical storm. That means that it did not have all of the characteristics of a purely tropical system and was more of a hybrid cyclone. As far as effects on the coast, its technical classification makes no difference. It was still predicted to bring extremely heavy rain, gusty winds and, just east of where the center makes landfall, a rise in ocean water of up to a few feet above normally dry land. Panama City clocked a wind gust to 59 mph as the storm approached the coast. A tropical storm warning remained in effect for the Aucilla River in the Big Bend area of Florida to the Mississippi-Alabama border. As of Monday at 5 p.m., Alberto’s peak sustained winds had fallen from 65 mph this morning to 45 mph, and it was crawling north at 9 mph. Alberto became the ninth named storm to make landfall on the continental United States before June 1 on record. The last time a named storm made landfall in this area was Tropical Storm Claudette in August 2009. A storm surge or rise in water of one to three feet was still expected along the coast to the right/east of where Alberto makes landfall. After landfall, Alberto’s winds are forecast to continue decaying, but the rainfall will continue northward through Alabama and, eventually, Indiana by Wednesday. Elevated rainfall totals over the next three days trace out that northern trajectory. The National Hurricane Center projects 4 to 8 inches of rain with isolated amounts up to a foot into the Florida Panhandle and much of Alabama and western Georgia. It’s also worth pointing out that extremely heavy rain continues to fall over Cuba from a trailing moisture plume; this is the fifth consecutive day. Trivia: Although subtropical storms have long been a part of the historical record, they were not officially given names until 2002.